After three days of rioting looting and other madness, peace finally seems to have returned to the streets of London. I live quite close to some of the incidents that have taken place and have seen some of the burning shops with my own eyes. Scary to say the least. London is now finally returning back to normal, but the burned out buildings and the smashed in shop windows are an ugly scar that will continue to remind us what happened last week. Whenever dramatic and sudden events like these riots occur, the market shows some clear movement. It is easy to predict where these opportunities will arise. Remember Maslov’s pyramid of needs? That’s where you will find them! The London riots made people feel insecure and unsafe. I spoke to a few local shop owners; some of them had boarded up their shop windows in fear that the windows would be smashed. Others feared for their own safety, even during broad daylight. Maslov identified safety as one of the primary human needs. People have a strong need to feel safe all the time. That’s why some people have three locks on their doors and others carry pepper spray with them wherever they go. It wasn’t too difficult to predict that shop keepers and general members of the public would feel threatened by the riots and would have an increased need to protect themselves and their shops. Their solution? Baseball bats. Baseball bats are legal, they’re cheap and they do the job. Having something that can be used to defend and protect ourselves makes us feel more secure. Amazon reported a 6000 per cent (!) increase in baseball bat sales during the London riots. I hope that some marketing manager spotted this need early and increased baseball bat prices in response. So are we going to sell baseball bats on the corner of the street the next time all hell breaks loose? Of course not. But what we can take away from this is that many products and services are affected by basic human needs, such as security. Make sure you identify events that can cause sudden shifts in the needs for your products or service, and ensure you know how to act when they happen. Opportunistic behaviour? Absolutely. But the only thing to condemn here is the Ludacris actions taken by rioters and looters. Everything else is just business. Questions: can you identify events that can potentially trigger mass increase in demand for your products or services? What are they and why? How do you respond? 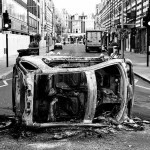 4 Responses to "London Riots: the Aftermath"
First of all, LOVE the new look Tom. Neat! Glad to hear that all is well with you and you can keep a positive attitude. I followed the events on the news and I was amazed at how fast the riots spread and got out of hand. This had nothing to do with the shooting anymore, it was pure madness! Now tell me Tom, did you start these riots because you were planning to enter the baseball bat business? Thank you for the kind words; appreciated! No in all seriousness, I’m glad it’s over and that it didn’t lead to anything worse. I hope the riots are at an end Tom. I couldn’t almost belive this was happening in London when I saw it on the news. Things have really calmed down now; let’s hope it stays that way!